A Medtronic plutonium pacemaker from 1974. How ironic that the heaviest naturally-occurring element, plutonium, was named after the dwarf planet Pluto. Plutonium was discovered in 1940 by Glenn Seaborg and his team at Berkeley University. His research became part of the top-secret Manhattan Project, so its discovery would not be made public until after the atomic bomb called Fat Man was dropped on Nagasaki to end World War II. Seaborg would receive the Nobel Prize in Chemistry in 1951 for the discovery of the transuranium elements, including: plutonium, americium, curium, berkelium and californium. There are five isotopes of plutonium but only two have commercial uses: P-238 and P-239. P-239 is what is used in nuclear weapons and to fuel nuclear power plants. With a half-life of about 24,000 years, this is some pretty nasty stuff. In 1945 and 1946, during research for the Manhattan Project, two scientists died and many others had their lives cut short in two separate incidents with the same plutonium core that briefly went critical: first because a researcher accidentally dropped a brick on it, and once when a researcher accidentally encased it in a neutron reflector. Due to these accidents, the core would become known infamously as the Demon Core. P-238 has a half life of only 88 years and is much less dangerous—its radioactivity is known as alpha decay, where it emits a helium ion instead of gamma or X-rays. This type of radiation is much easier to shield and since a kilogram of P-238 can generate over 500 watts of power for decades, it’s perfect as an onboard power plant for space probes: Viking, Galileo and Cassini to name a few. 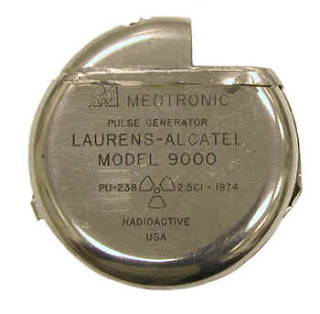 For a while in the 1970s, P-238 was used to power pacemakers for patients who did not want to risk repeated surgeries every time their battery wore out, and although pacemakers now use lithium-iodide batteries, there are still 50-100 people still living with functioning P-238 pacemakers.